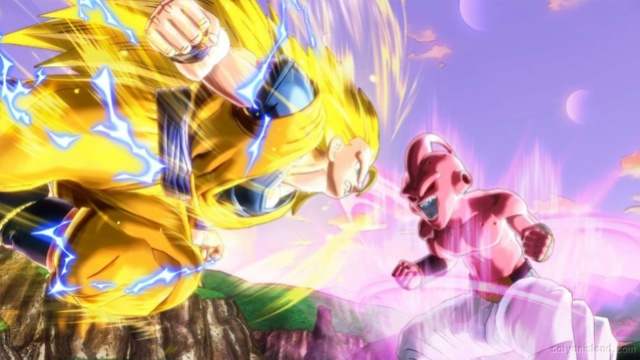 Dragon Ball XenoVerse developer Masayuki Hirano told IGN that their new game wasn't going to follow the typical storyline (cannon), but would instead distort the story so that fans can rewrite it. XenoVerse will create a new-world setup that offers all fans new story which gives a new take on the series, especially for veteran fans. The game is filled with some of the most memorable scenes of the series that players will uncover as they fight to restore those stories with their original character. Players will run into characters both old and new as they make their way through time in an attempt to fill in the blanks. Familiar characters such as Goku and Vegeta, including their Super Saiyan 4 forms, as well as Cell, Freeza and many others will be found throughout the game. XenoVerse adds more to the story with two new characters, Towra and Mira. Towra is a dark scientist from a demonic world who created Mira, an android, who's programmed to be driven to become the strongest being in the universe. The two team up with the Supreme Kai of Time along with the time-producing TokiToki whos only goal is to change the past to suit their own needs while gathering as much Keri as possible. In order to defeat them and restore time back to what it once was, Time Patrol Trunks uses Shenron to summon the player's character where he sends you back in time on your first mission to intervene and correct the timeline. Before any fighting begins, players will be shown blurred images as well as a range of text of a past that doesn't really make any sense. As the player begins to arrive in the past, they are shown the battle scene in which time has been interfered with before you completely emerge in that time. This is where nostalgic fans will begin to feel the need to correct the wrong in order to continue along their journey of their favorite scenes. Character customization is the key feature for this game as it lets the player put their personality and imagination into a character. The character will be highly customizable as you can choose between five different races - including Saiyan, Earthling, Majin, Namekian and Frieza's race - in which the player can adjust their characters gender, head, and build. Another characteristic that can be altered is their voice. Players can change the characters voice to sound deep, soft, or any other variant by changing the flanger, harmonizer, echo and tremolo settings. Customizable items and cosmetic items will also be unlocked as rewards for completing battles. Cooperative play with friends is encouraged in this game as you get more exotic items the harder the fights are, along with various other factors. XenoVerso also introduces a new Master system in which the player is allowed to choose a Master, like Vegeta and Goku, where they will teach you skill sets and training patterns of their choosing. Masters will intervene on the battlefield during a fight and will also have conversations with you that depend on the players actions. For instance, changing masters from Vegeta to Goku will in turn make Vegeta jealous and act as such. XenoVerse also introduces a new power called Villainous Mode. Villainous Mode occurs after Towa gets a hold of Frieza, Cell, and Kid Buu and transforms them into a "villainous" version of themselves giving them new powers and abilities that have not yet been seen in the cannon. Players will have to unlock each character's Villainous Mode individually by completing quests with an overall high score allowing the player to replay the quest with a more powerful character. The Villainous mode gives players the opportunity to gain ever greater rewards but also has a drawback by taking away rewards if you loose the quest. Players will be able to visit numerous locations throughout the Dragon Ball universe including Earth as it is apart of the franchise. Other locations include the futuristic TokiToki city where players can meet up with more than 200 other players to take on quests and other cooperative missions. Players can also meet here to participate in the online tournament, Tenkaichi Budokai. Rosters for the tournaments will pit people of equal footing against each other to test their skills and determine who is the best. Alongside a description as to what to expect for the storyline of the game, Bandai Namco Games and Dimps have revealed that they are working on three post-launch DLC packs will be distributed throughout the year with the first pack expected to be released in March. The first DLC pack will contain three playable characters (GT Goku, Pan, and GT Trunks), four Time Patrol quests, 12 quests, 15 special movies for player's characters, and five costumes. Information and release dates on the two remaining DLC pack will be "coming soon." Dragon Ball XenoVerse will be playable on PS4, PS3, Xbox One, Xbox 360, and PC and made available for purchase on February 27th.